For your intimate Valentine's Day evening, opt for this on trend accessory to give you a style which is both original and romantic. Take a closer look at these 3 hairstyle ideas which are achievable in under ten minutes! This tied-up hairstyle will give a bohemian touch to your look, whatever that may be. To achieve it, mark out a clear middle parting. Then place your headband on your head so that it flattens down your roots. Then pull your hair back through and underneath the elasticated headband on either side. When you reach the nape of the neck, twist your hair to form a chignon. Hold it all in place with as many hairpins as required. Not forgetting to apply hairspray for extreme hold. Add an Oriental touch to your look by opting for this modern hairstyle which is ultra-easy to create. First of all, mark out a middle parting. Then place your headband, positioning it on your forehead. It must go across your forehead straight. Finally, pull lightly on your roots to lift them. Option: leave your hair as it is or alternatively, create a wavy or scrunched effect. Adopt this retro-chic style for an irresistible pin-up look. 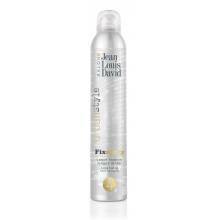 Firstly, spray thermo-active treatment on your hair. Then straighten your hair out strand by strand. Backcomb your roots underneath and on top to achieve a slightly curved effect. Then put your headband on, straightening out any small hairs at the front. Apply hairspray and you're finished! Braided, golden, silver or with sequins...Your headband is a piece of jewellery in itself. Dare to wear a style of headband that gives you a look which is both a little bit different and full of personality.